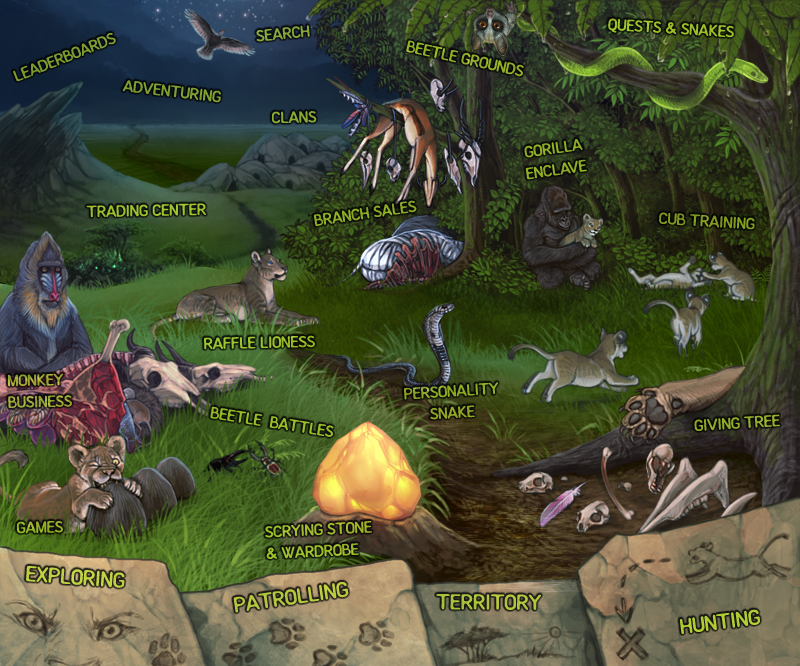 Explore and adventure different territories to interact, battle and claim lionesses in the Lioden world. Send your submales off to patrol and protect your territory. Send your best lionesses off to hunt and maybe they will bring back food for your pride to enjoy. Train your cubs to prepare them for adulthood - whether they will become a hunter or patroller, they need to be trained. Accept and complete quests, and discover karma and fertility levels and items with these slippery snakes. Learn about lion personalities and purchase special personality items from this slithery fellow. Find out the territories which surround you and see if you can successfully attack any of your neighbours. Visit our favourite Mandrill to buy and sell various goods - you never know what you'll find here. Purchase Gold Beetles from the game or other users here and use them to purchase special items and services. Browse member trades and raffles, or even list your own, in the Trading Center. Find out what other members have for sale on their branches. Find items that other members have left lying around, or cubs that others have brought here. Take a quest from the Gorilla and submit your cubs to him in order to trade for some special items. Every week a new lioness will come to the lands of Lioden - will you be able to claim her? Become involved in member clans and find yourself a new group of friends. Search and filter the game for lions and members. Train your battle beetles and purchase food for your beetles. Battle your mighty beetles for fame, glory and riches! Well, maybe not riches.. Interested in the future? See what your cubs will look like when grown, find out how many cubs your lioness is pregnant with, or even check yourself out in the Lion Wardrobe. Find out who the top members, kings and pride lions of the whole game are. Need a break from the daily stresses of looking after your pride? Play games here!